We were lured to The Recess Room when a mailed press kit came our way with thematically-appropriate accessories for the soon-to-open restaurant to debut in Fountain Valley. 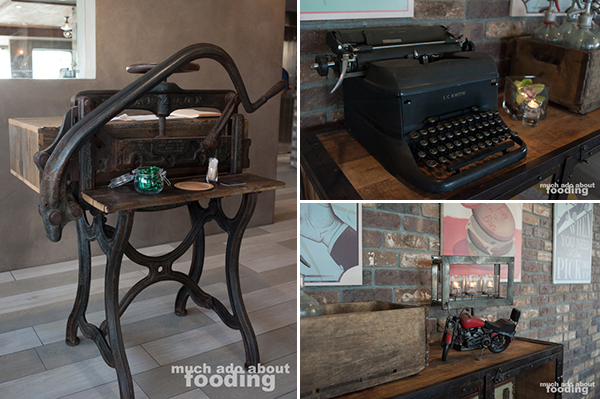 It had an "old school" vibe but more importantly beyond the initial pizzazz was the restaurant's origins, team makeup, and intriguing menu. Right away, we were tempted once we saw their list of dishes composed of ingredients creatively put together that we hadn't seen done elsewhere yet. Built from a team of childhood friends, The Recess Room has come to fruition under the guidance of Viet Pham, Chef Sergioivan Ortega (Social, Arc, Providence, Cucina Enoteca), and Mixologist Carlo Navvaro (Pure Nightclub at Caesars Palace, Wynn Hotel, Kahunaville at Treasure Island) among many others. 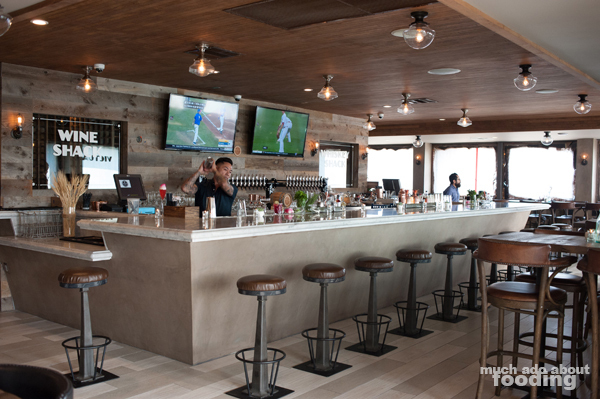 Though not open yet, the restaurant did host us recently, and we were very much impressed by what will soon hit Orange County's restaurant scene. This is an opening you won't want to miss. The restaurant's name is the restaurant's game. There is a vintage chic feel to the place, and the decor is curated from pieces of either existing nostalgic paraphernalia or commissioned hand-painted artwork in that style. Their accent lighting and marble bar tops adopt the style of 1920s big city joints to add a touch of swankiness to their bar which will feature 24 craft beers on tap, California wines, a wide selection of whiskeys, and cocktails made from in-house ingredients (bitters, shrubs, syrups, etc) and onsite herb garden garnishes. 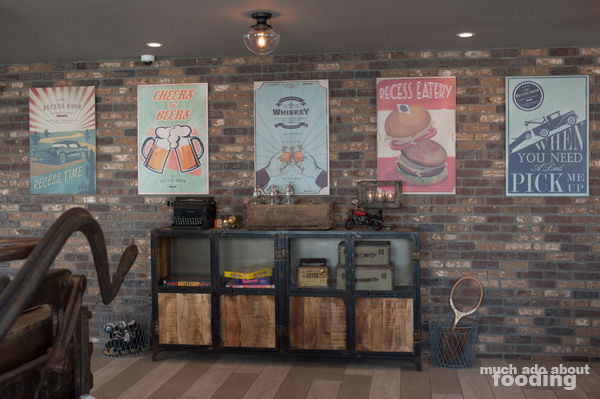 Their tables were formed from 100-year-old wood from a Kentucky tobacco farm, showing off a worn but comfortable feel to each panel, and even their ceiling is made up of redwood paneling to mimic an old school basketball court floor. We were especially interested in the hostess desk that you are forced to stare at when you walk in because it is a newspaper shear/paper cutter from Europe from the 1900s. Aside from the trip down memory lane, these pieces came together well to perpetuate the romanticism we have thrust upon the years of yore and perhaps to prime guests to the culinary experience they will soon have - one of working with seasonal ingredients and focusing on the base tastes of simplicity mixed with hard work. 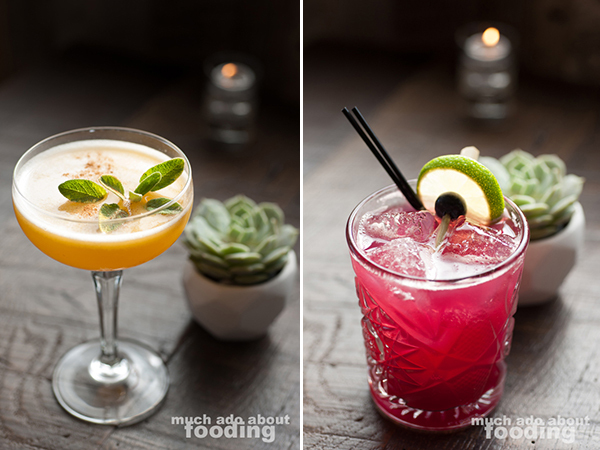 We began our menu preview with a slew of their mocktails which were so impressive that one doesn't really require alcohol to be added (though it wouldn't be a bad thing). Not only are the ingredients important to note here but the names are also quirky as well. I started with the Recess Peaches ($6 - handcrafted peach shrub, apple cider, Saigon cinnamon, sage), an elegant drink that really felt autumnal in flavor. 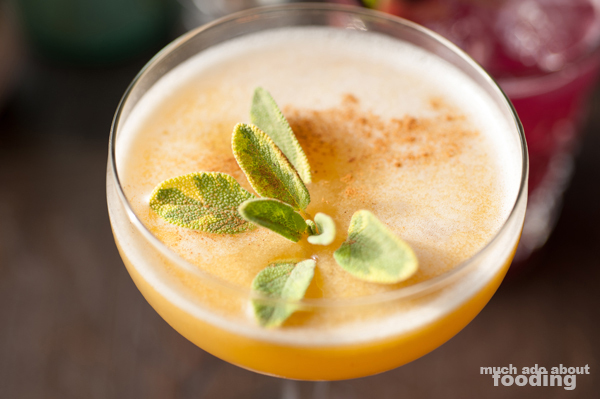 The mix of cinnamon, sage, and apple cider was enough to make you feel like you were drinking down a cobbler but the thick heft of their peach shrub brought it over the top; sipping on this for even a dessert wouldn't be such a bad idea. Duc started with The Gatsby Mule ($6 - handcrafted ginger beer, sage-infused blueberry cordial, lime) as we were informed that ginger lovers would enjoy this. We were not disappointed in the slightest - this was a mocktail quite heavy on the fresh ginger taste but in the wake-you-up-well way. The blueberry cordial was just a way to add sweetness to something that was pleasantly spicy on the tongue. 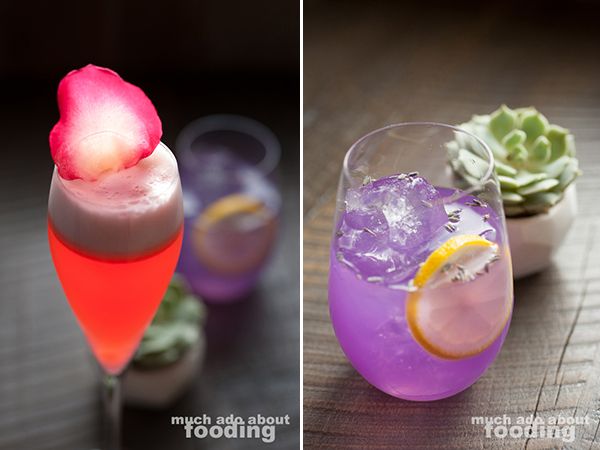 Next came the Roses Are Razz ($6 - raspberry rosewater cordial, elderflower, hibiscus tea, lemon) and A Periwinkle in Time ($6 - handcrafted lavender lemonade, coconut water), both drinks that seemed to glow brilliantly all by themselves. Their colors were captivating and bright, just as their tastes were. Perfect brunch drinks, anyone? The menu is quite diverse and though the restaurant is not open quite yet, we wanted to share what dishes we could before the menu changes again. They anticipate it shifting every few weeks based on seasonality. I suppose that'll give you the opportunity and incentive to come back frequently. So even though there will be occasional changes, the experience is to remain static with the focus being on sharing plates with everyone else at the table. It's a social experience; it's "recess" for all! We had a few to begin with: Ceviche ($12 - Hokkaido scallop, rock shrimp, plantain chips, heirloom pepper, sweet corn, cherry tomato, guajillo chili), Wagyu Tartar ($15 - ribeye, roast chili flakes, tamarind, cilantro, shallots, lime, taro chip), and Portobello Fries ($12 - Pecorino Romano, buttermilk, chive, jalapeno crema, dijon aioli). Immediately seeing that the "dippable" shared plates came with accompaniments other than tortilla chips and toast was refreshing. 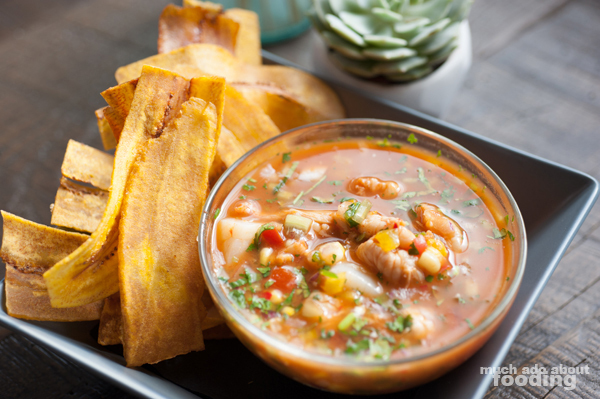 I liked how the ceviche came with plantain chips; it was appropriate in the cuisine sense but also matched each other well flavor-wise. The scallop and shrimp were plentiful but so was the liquid overall which we were a tad crestfallen over once whisked away; there wasn't a way to sop up the remaining juices once we had finished the solid pieces in the ceviche so it felt like a waste. Tart and tangy, this was a great ceviche to share. Duc was particularly partial to the tartar and fries. 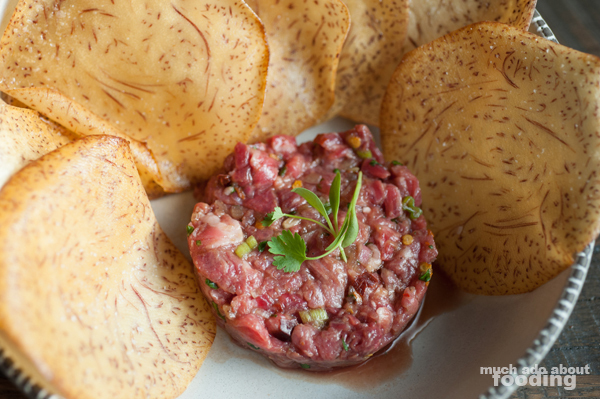 We were both curious about the tartar once we saw "tamarind" as one of the ingredients and also glad that taro chips were the "vessel" for the beef. The tartar came out quite tender, and the tamarind combined with other Asian-inspired ingredients really turned this dish towards the Thai cuisine realm, an enjoyable change of pace from the typical tartar. It was sweet and acidic at the same time with plenty of savoriness to boot. 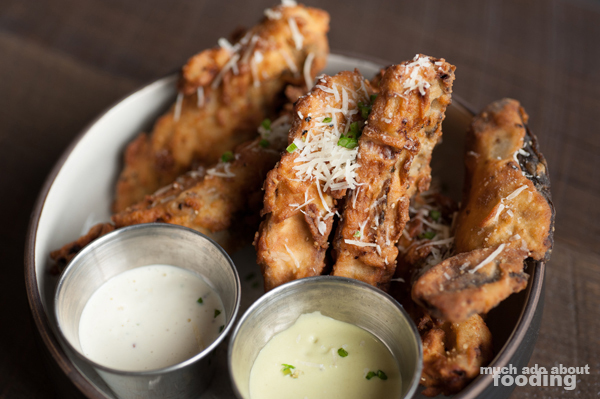 If you needed more umami in your meal, the Portobello fries definitely pushed that agenda; these battered slices of what I can only see as being enormous mushrooms were perfectly fried and accompanied by tasty dipping sauces. The shared plates kept on coming though, and our next round contained one of my favorites of the evening - their Beef Chicharron ($8 - beef tendon, trout roe, onion creme fraiche, chive, petite watercress, shin cup seasoning). The naming of the dish piqued my interest right off the bat as I am accustomed to chicharron being primarily made from pork; what would beef chicharron be made of? Then upon reading the ingredients, I was even more curious as it was made from beef tendon rather than belly/skin. 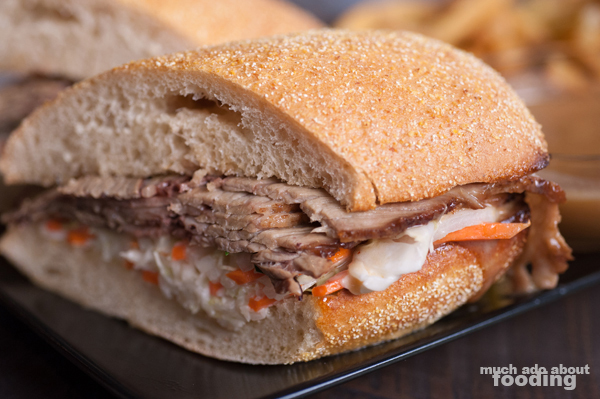 What came out was extremely crunchy, well-made, and powerfully delicious. The process of making these treats was explained to us and sounded quite tedious but for good reason - they were a good product! The addition of trout roe turned on a nostalgic trigger for me as I was reminded of the "shrimp" chips I had growing up though it might not be for everyone. 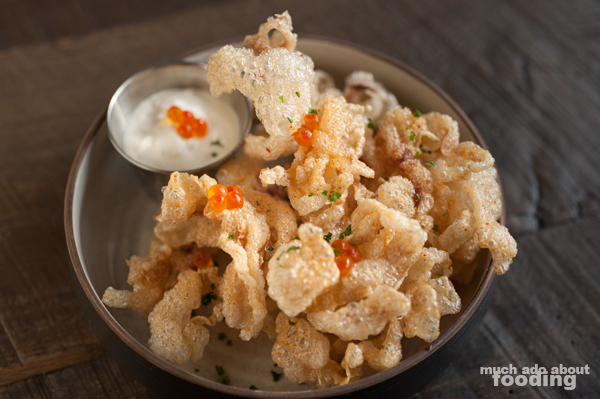 I'm willing to bet not everyone would tolerate fishy chicharron but trust me, it's delicious. They also dusted the pieces with their own housemade "Shin Cup" seasoning for good measure. From the whole pack we tasted, the two that didn't fit our fancy to the fullest were their Beet ($12 - sangria beet, golden beet, strawberry goat cheese, and pistachio powder) and Bone Marrow Mac & Cheese ($12 - cali-cal Chedder, goat cheese, orecchiete, bechamel) which also each had their own great points. 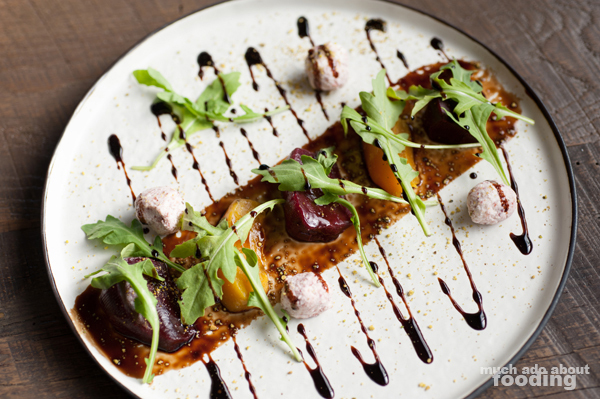 For the beets, the restaurant had whipped together their own balls of strawberry goat cheese which played nicely against the balsamic glaze drizzled atop the beets but that combined with their creative pistachio powder/dust did not elevate the dish to the same level as the other dishes. It ultimately was a beautifully plated dish of beet chunks. 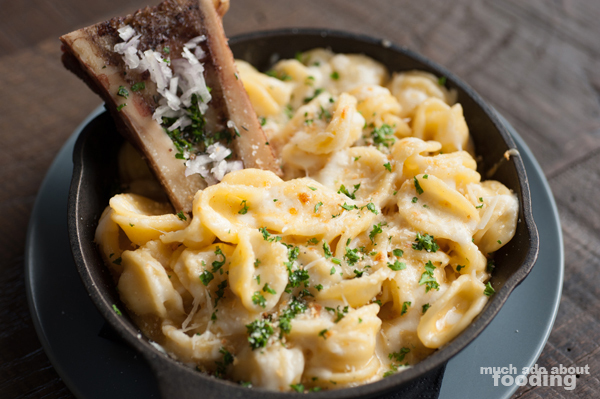 As for the mac & cheese, we thought the use of orecchiete was a fun touch but because bone marrow is not a full liquid/spread, it could not be evenly disbursed throughout the whole dish, leading to some areas that were just pasta in light cheese. That being said, the parts that the bone marrow did top off were excellent. After all of those shared plates, we still had a few entrees to give a taste. The Recess Room does feature full plates for those wanting to go that route, and so we tried out their Veal Dumpling ($14 - tomato, garlic, marsala wine, creme fraiche, Parmesan) and Hue Dip ($14 - braised brisket, spicy lemongrass, jalapeno slaw, coriander, ciabatta, beer batter fries). The dumplings were hearty and just plain comforting. 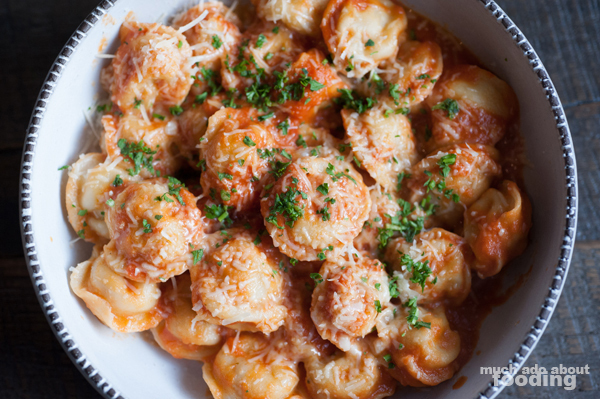 They were a more sophisticated form (by leagues) of the Chef Boyardee "comfort food" you might have had after a bad day at school, and they were generously filled with the veal. As for the hue dip, we were extremely curious about this as it is inspired by bun bo hue, a Vietnamese noodle soup that has an iconic and defining taste consisting mostly of lemongrass. 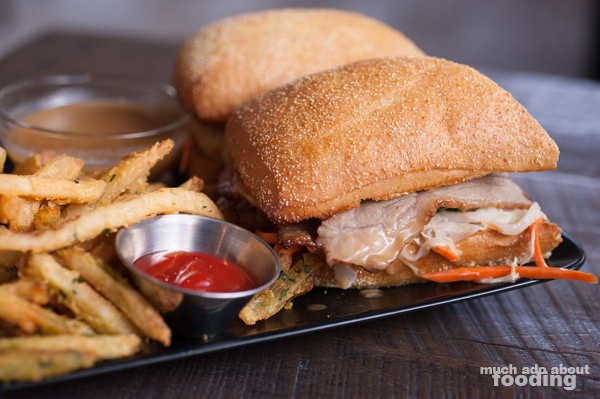 The restaurant did a fantastic job at truly capturing the noodle soup's flavors into a sandwich form, and the concentrated "broth" dip you could dunk your sandwich into was superb. Oh and the fries? Fabulous. After all of that, there was still space for dessert to be had but because of their extensively intriguing dessert menu, it took us a while to finally settle on the Tres Leches ($8 - Spanish sponge cake, condensed milk, Vietnamese coffee, strawberries). 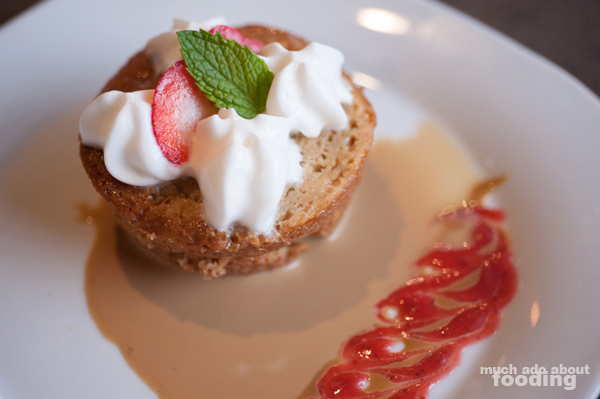 This was a moist cake that managed to also be light in weight of flavor while still prominently showcasing the Vietnamese coffee poured over it. It was devoured quickly despite our nearly-bursting stomachs by that point. What can I say? It was an appropriate end to the meal. Overall, I can see that The Recess Room will do well. Located at 18380 Brookhurst St., Fountain Valley, CA 92708, it is in a highly visible spot from a highly trafficked street. This restaurant might even be the next hot new restaurant once it gets its community groove going. We are excited for when they open in the coming weeks and will surely return! I am so excited! This is a few blocks from my house. Everything looks amazing!